The “yellow vest” protests have been “a catastrophe” for the French economy, the finance minister says. France has seen four consecutive weekends of demonstrations against fuel tax rises, high living costs and other issues. About 125,000 protesters took to the streets on Saturday, with more than 1,200 taken into custody. President Emmanuel Macron is expected to announce anti-crisis measures in an address to the nation on Monday. Finance Minister Bruno Le Maire called the situation “a crisis” for both society and democracy. “It’s a catastrophe for business, it’s a catastrophe for our economy,” he said during a visit to shops in Paris that had been damaged during the protests. The capital was particularly badly hit, with windows smashed, cars burned, and shops looted, as 10,000 people took part in demonstrations. “There was much more damage yesterday than a week ago” because Saturday’s protests were more dispersed, deputy mayor Emmanuel Gregoire told local radio. However, he added that there had been fewer injuries compared with last week. Meanwhile Foreign Minister Jean-Yves Le Drian responded angrily to US President Donald Trump, who on Saturday in tweets appeared to suggest the Paris Climate Agreement was the reason for the unrest. “I say this to Donald Trump and the French president says it too: leave our nation be,” Mr Le Drian said. President Emmanuel Macron – who many protesters want to stand down – will address the nation at 20:00 local time (19:00 GMT) on Monday. He is expected to meet trade union and business leaders in the morning, according to union sources. Mr Macron has kept a low profile so far during the protests. How bad is the economic damage? It is too early to calculate the full economic cost – but it’s clear the damage is severe. 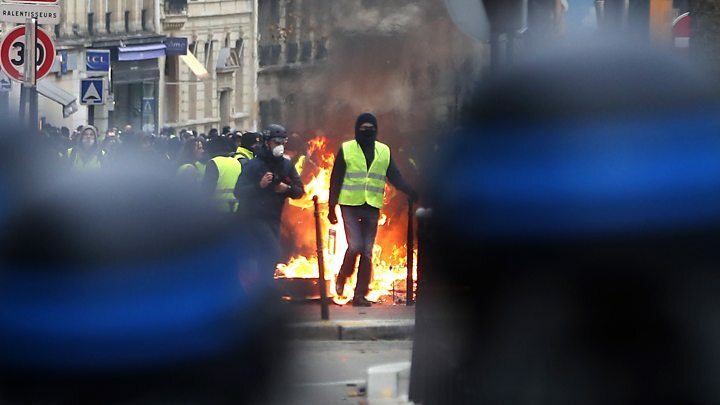 Le Parisien newspaper reported that in the capital about 50 vehicles had been burnt and dozens of businesses vandalised, with some of them looted. The authorities in the city say that riots have caused millions of pounds of damage. On Friday, the French retail federation told Reuters news agency that retailers had lost about €1bn ($ 1.1bn; £900m) since the protests first began on 17 November. Mr Le Maire said last week, before the most recent protests, that the restaurant trade had declined by between 20% and 50%. And Francois Asselin, head of the confederation of small and medium-sized businesses, told the Journal du Dimanche newspaper (in French) that overall the protests could cost his members €10bn. There are concerns that the protests could lead to a drop in tourism. Paris was visited by a record number of tourists in 2017 – more than 40 million, the Paris Tourism Office said last month. 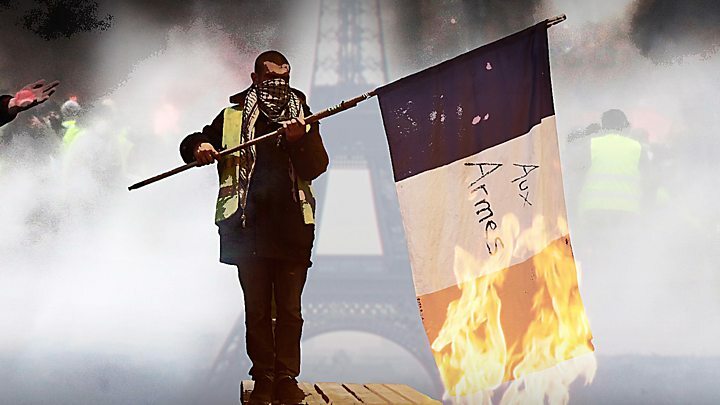 What is the yellow vest movement? The rallies became known as the “yellow vest” or “gilets jaunes” movement because protesters took to the streets wearing the high-visibility yellow jackets that are required to be carried in every vehicle by French law. The government has since agreed to scrap the fuel tax increase and has frozen electricity and gas prices for 2019. The movement’s core aim, to highlight the economic frustration and political distrust of poorer working families, still has widespread support. An opinion poll on Friday suggested a dip in support for the protests, but it still stood at 66%. Meanwhile, President Macron’s ratings have fallen to 23% amid the crisis, polls suggest.